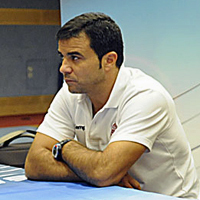 30.05.2012 - Itxako's trainer Ambros Martìn will take over coaching duties up from the summer at the Hungarian champions. 17.05.2012 - Hungarian striker Anita Görbicz (Győri Audi ETO KC) finished the season with 133 goals. Bošković: "We all believed in this success"
15.05.2012 - Budućnost President thankful of past stars. 14.05.2012 - After the success of Buducnost, hear what the players passing through the Mixed Zone had to say.